Anthony is a professional rugby league player, a powerhouse and a Veganuary Ambassador. To keep up with his training programme, his meals need to pack a punch, too. 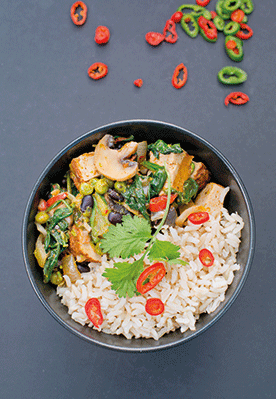 This is his simple-to-make, great-tasting, nutrient-rich Thai curry. And we love it! 1. Fry the onion in the coconut oil for 8-10 minutes until translucent. 2. Add the mushrooms, garlic and chilli. Cook, stirring, for another five minutes. 3. Add the beans, peas, asparagus, tofu, soy sauce, curry paste and coconut milk. Bring to the boil, and let simmer for 5 minutes or until asparagus is soft. Stir in the spinach until it wilts. 4. Serve with brown rice.